Overwhelmed by Life? Do This One Thing. The next time you feel overwhelmed by life try doing this one thing. Do it for as long as the overwhelm lasts then you get back onto life’s crazy train. Often we are overwhelmed by life because of the stresses we put on our own life. The demands we put on ourselves. On our children. What we think “has” to get done. When things aren’t going according to our plan or when everything is out of control and we feel like we can’t handle one more thing, the fault usually lies within ourselves. Recently, I was feeling overwhelmed by life with a never-ending to-do list that included the amazing sports schedules of two pre-teen children, two dogs, running a business, and being the only caretaker of my household. Naturally, like most women, I had a running list of things I needed to accomplish in my head. It was nearing 8 pm and I was a long ways from crossing off at least half of my list. Then one of my children began complaining about something I had been going out of my way to do for them repeatedly that week. I couldn’t handle it. All that was in my head was my looming to-do list. I sat very still (and alone) for about 3 minutes and I asked myself what 3 things absolutely have to get done tonight? Burn, shred, tear up the former to-do list. The new list is – what 3 things if done tonight will erase my overwhelm? 1.I had to feed my children dinner. 2. I had to keep my dogs from killing each other (yes, seriously). 3. And I had to shower. That was it. I didn’t have to read. I didn’t have to work out. I didn’t have to send that email or respond to that text. If I could only pick 3 things, those were the most pressing 3. The next morning during my quiet time, before the house woke up, I was determined not to have another day like yesterday. My to-do list that was undone from yesterday felt like it was being taped onto today’s in some kind of sci-fi movie way. Before I could get too stressed, I decided to break my day up and ask myself what 3 things needed to be done just this morning? Don’t even try to look at the afternoon or evening yet. If I do, then I’ve just made a huge to-do list. When afternoon comes I’ll evaluate that list then. Of course, I don’t always break every day up into 3s and ask myself the top 3. Thankfully, life is gentle enough that we don’t feel overwhelmed 100% of the time. Generally, we go through waves. 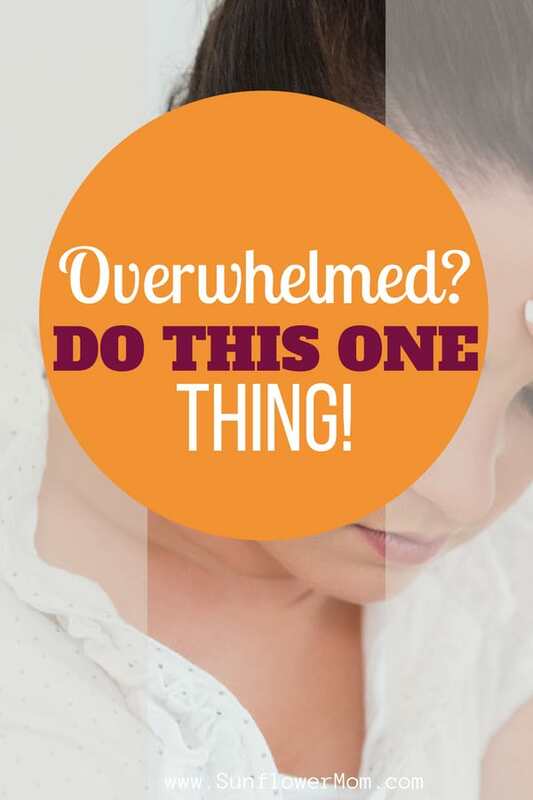 The next overwhelm wave you ride, try asking yourself this one question: what 3 things must I do to erase my overwhelm? And then just do those 3 things. If you get the 3 things done and feel like moving forward, you can try it. But don’t be surprised if that stresses you out. Sometimes, we need to do less so we have the energy for the days we don’t even know are coming. Listen to your body. Previous Post: « Vacation in with Kids in Colorado Springs – and your Dog!